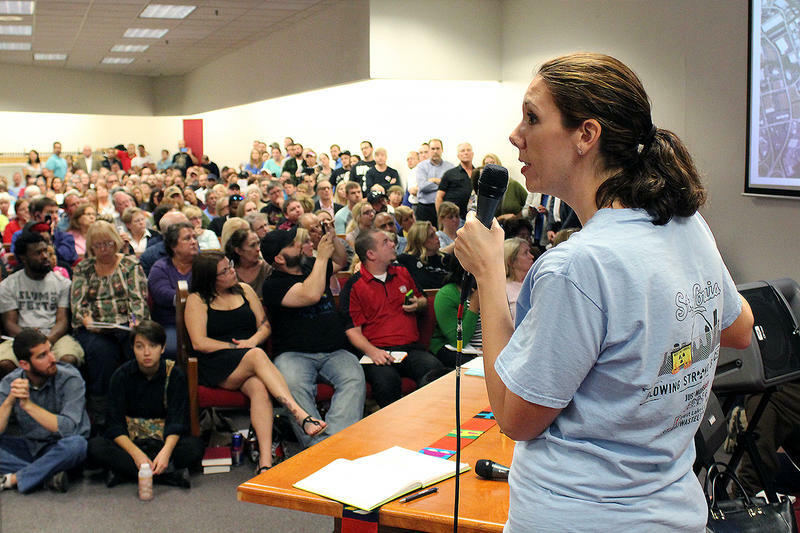 About 300 people crammed into the Machinists' Hall in Bridgeton for a meeting of the Community Advisory Group. Over 45 minutes that were frequently interrupted by questions and accusations from the audience, Dr. Paul Charp of the Agency for Toxic Substances and Disease Registry outlined his findings that the public health risk near the site is minimal. Charp said one major concern — whether radioactive elements have leached into groundwater at unsafe levels — should not affect human health. “The EPA and the state informed us that no private wells in the area are used as a primary drinking water source.” Given that, “the groundwater is safe. As soon as someone starts to use that water for agricultural purposes or drinking water purposes, then we need to talk,” Charp said. Residents took the mic to express their fears about the health risks of living near the landfills, questioned the validity of the report, and raised concerns over what would happen if the underground smolder in the Bridgeton Landfill reached the radioactive waste at the West Lake Landfill. Stoking many fears was an unrelated, short-lived brush fire at the Bridgeton Landfill on Saturday, which was first called in to the fire department by a resident. Some took that as a sign that the landfill’s owner, Republic Services, does not have an adequate handle on the site. “The site is under both landfill video surveillance, and 24/7 EPA and MDNR (Missouri Department of Natural Resources) environmental monitoring. The response protocols, which were first developed with local first responders, worked as planned,” Republic Services’ spokesperson, Richard Callow, said in an email. The EPA’s acting regional director for Region 7, Mark Hague, said his agency sent a letter reprimanding Republic Services for the incident. In addition, he said more groundwater monitoring needs to take place. During an earlier press conference with reporters, Hague said his agency’s data suggest that the underground smolder in the Bridgeton Landfill is not getting closer to the radioactive waste. In the unlikely scenario that the two do meet, he said the worst-case scenario would be a far cry from the situation detailed in an emergency response plan released earlier this month by St. Louis County. “Depending on what happened and what the composition of the material would be, if there were some subsidence or ‘dropping,’ if you will, of the current cover that’s on West Lake, there might be some increased releases of radon into the atmosphere that would dissipate out,” Hague said. In addition, Hague said engineers have taken sample cores from the West Lake landfill to study what happens if the radioactive material were heated. Hague said the EPA will announce plans for building a firebreak or isolation barrier between the landfills by the end of 2015. 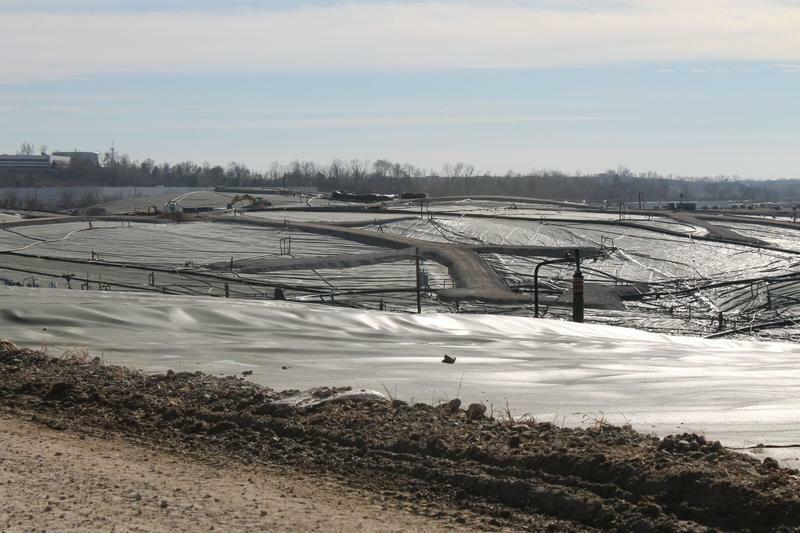 By the end of 2016, the EPA will propose a permanent solution to manage the radioactive material buried in the West Lake Landfill, to be finalized sometime in 2017 after the public has the opportunity to comment on it. “We know it’s very important for us to get a decision that can be implemented to give the public assurances,” Hague said. Dan Glennon, a father of three who lives in Maryland Heights, said his family is watching updates closely and hoping for the best, but they have planned out what they would do in an emergency. “We already have extended family who lives far away, we’ve made arrangements to stay with them if needs be. The problem is it’s uprooting our entire lives,” Glennon said. Glennon said he’s grown frustrated with the lack of transparency in the process — which starts to feel like a blame game between public agencies and the landfill’s owner. “We just need somebody, not to necessarily say it’s my fault or it’s this person’s fault, they just need to say, clear cut, this is what is happening,” Glennon said. Follow Durrie on Twitter @durrieB. An earlier version of this article said a decision on the firebreak would be made by the end of 2016. 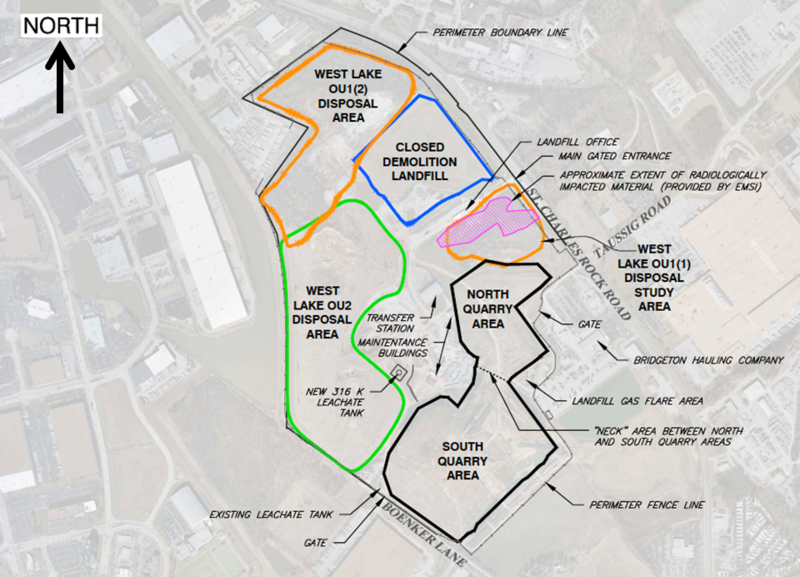 That decision will be made by the end of 2015, and a proposal for a permanent solution for the West Lake Landfill is expected by the end of 2016.